The planet Lusitania is inhabited by three sentient species. But, after the word of a deadly virus on Lusitania spreads to humankind, the Starways Congress gathers a fleet with a powerful weapon meant to be used on Lusitania, to wipe the planet out of existence. An evolved computer intelligence, Jane, has learned how to travel faster than light, and can send the residents on Lusitania to safer planets, but she is being shut down by the Starways Congress as well. Ender, the person that brought the Hive Queen, a sentient species, to Lusitania, is wrapped up in his own problems with his wife, Novinha, while Ender’s stepson Miro and Ender’s aiua creations hurry to devise a way to find as many inhabitable planets as they can with Jane’s power, and try to stop Starways Congress from destroying Lusitania. As Ender starts to die, along with Jane, Miro starts to love Jane and Ender’s aiua creation, Valentine, while Wang-mu, traveling with Ender’s second aiua creation, Peter, loves Peter as well. Peter and Wang-mu succeed at convincing Starways Congress to stop the fleet, however, the admiral at the head of the Lusitania Fleet disobeys the order to stop his fleet, and must be stopped by Peter. When Jane dies, her aiua is transferred to Ender’s aiua creation’s body, Valentine, and Ender’s dead aiua, along with Valentine’s aiua traveling to Peter. They must now find out a way to stop the admiral of the Lusitania Fleet, and Jane has to adjust to her new body, then maybe try to continue Jane’s faster- than-light trips. At first, I thought this would be more of a cross between adventure and with scientific, but as I read further into the book, I found some romantic stories, along with some dragged out deaths that I found interesting, because the aiua of the dead characters get transferred into new bodies, so in a way, the dead still lives. I also found many heated arguments and philosophical sayings from Peter, Wang-Mu, and “God Whispers”. This book has some complicated vocabulary, but the book is easy to comprehend and addicting to continue until end. I would suggest this book for the ages from 13-18. This book has a good theme and conflict, but the ending is a bit too romantic. If I were to go back in time, I would choose this book again, because reading the book is an exciting experience, and is hard to be put down after reading a few chapters into the book. This book can help readers know a bit more vocabulary if they are around 8th grade level, and if they bother to check out the unknown words in a dictionary. I wish that the author may mention a bit about Han-Qing-Jao, who is the one that writes the “God Whispers” at the start of each chapter, instead of the having one sentence from the “God Whispers” book. Overall, I rate this book 8 out of 10 stars. 1. Why did Wang-Mu lob a bee at Peter? 2. What is the reason for Ender to take out the jewel in his ear, then showing the jewel to Novinha? 3. What kind of “image” was Young Valentine to Ender? 4. Why was Peter’s clothing shameful to him as he walked out of a restaurant where he recently had a meal with Wang-Mu? 6. Why does Miro ask Ela and Quara to come with him on a starship, when Jane might not be able to bring them back from space? 7. What does Valentine want Novinha to do when Ender was dying? 8. What happened after Jane’s aiua took possession of Ender’s bodies? 9. Why does Miro tell Young Val that she isn’t anything but Ender, and he never loved her? 10. How did Jane take possession of Ender/Val’s body when she was trying to give it to Ender? 11. What feelings does Jane have that Miro calls “influenza”? 12. Why does Miro think all he is is a diversion to Jane? 13. Why does Lands put a docility patch on the back of Causo’s neck? 14. Why were there no prayers after Pilkt finished “speaking: Ender’s life? 15. 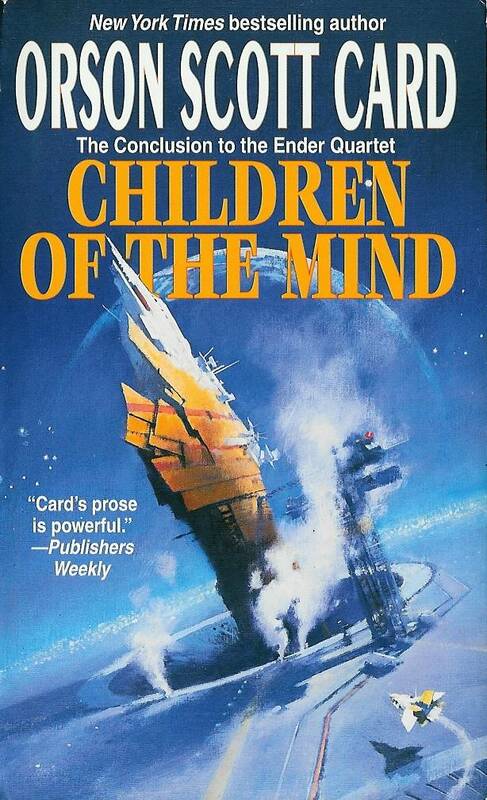 Why does Orson Scott Card feel a “powerful kinship” with Kenzaburo Oe? 15a. Both have brain-damaged kids, and both have to deal with this “simple fact of life”.